In my mailbox on October 28th, 2011. Samara is the sixth largest city in Russia. 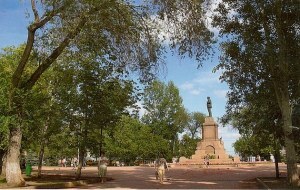 It is situated in the southeastern part of European Russia at the confluence of the Volga and Samara Rivers. Samara is the administrative center of Samara Oblast. Formerly a closed city, Samara is now a large and important social, political, economic, industrial and cultural center of European Russia, which in May 2007 hosted the European Union—Russia Summit.